Mike Petersen's Kempo Karate School provides an exciting and dynamic atmosphere dedicated to the instruction on real world self-defense. Our focus is to teach realistic self-defense in a non-aggressive manner. Students will learn aspects of stand-up fighting, ground fighting, throws, chokes, joint manipulation and pressure points, as well as basic defensive weapons skills. Our goal is to teach awareness skills and avoidance as your first line of defense, but to be able to defend ourselves if escape is impossible. 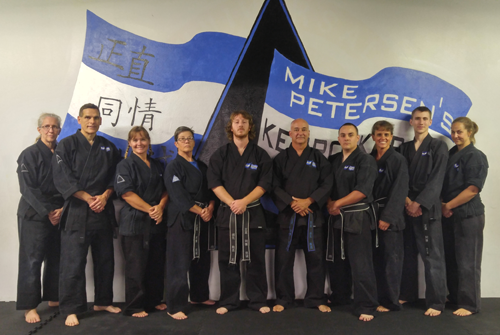 Operating in a sizable dedicated training area, Mike Petersen's Kempo Karate School's staff of certified instructors provides a small group atmosphere with the advantages of a large, diverse school. We constantly stress humility and acceptance in an effort to improve the Mind, Body and Spirit. "Loyalty is earned- never demanded."